Quebec City and Montreal get all the fanfare, but putting other smaller towns on your Quebec itinerary ensures you get a broader view of the province and the wonderful people that live there. Located on the shores of the Saint Lawrence River in Quebec, Tadoussac is most famous as a whale watching destination. Many tourists arrive in their cars and hop straight onto a boat without checking out the town. Don't make this mistake! Tadoussac is a charming small town of historic importance and well worth further exploration. Getting to Tadoussac requires a 10-min ferry, which operates 24 hours, is free of charge, and will accommodate your vehicle. Built in 1747 by the Jesuits, Petite Chapelle is one of North America's oldest wooden churches. Built by Jesuit missionaries as part of their efforts to convert the indigenous peoples to Christianity, the chapel is also known as the Indian Chapel and it contains a small exhibition on missionary life. Pay what you like to visit this little slice of French Canada's past. There's usually a nice lady inside to help interpret the building and its history for you. This replica of the continent's first fur-trading post highlights the history on the first transactions between Aboriginals and Europeans. The Chauvin Trading Post is a small but informative attraction is based on the original trading post from 1600. It offers a brief bilingual history of Tadoussac from its early beginnings until the present day. Many actual examples of the types of fur traded over 300 years ago and interpretive panels explaining the history are on display. If it's not too crowded (it can only accommodate about 30 people at a time), the guide will be all to happy to discuss the history with you. Though the majority of tourists come to Tadoussac for whale watching and rarely leave the harbour's immediate vicinity, it's worth taking the time to explore a bit of the area for a wider take on the town. One walk definitely worth taking is along the boardwalk and well-marked Sentier de la Pointe-de-I'Islet Trail. Not strenuous or technical, this natural, rocky hike is suitable for kids or mobile seniors. The trail starts to the left of the Marine Mammal Interpretation Centre up a flight of stairs, where you head into woods but shortly pop out onto a rocky bank overlooking the bay. Bring a jacket or sweater so that you are comfortable stopping to appreciate the views - as it can be chilly and windy next to the water. If you are lucky, you may even see some passing minke or beluga whales. The region where Charlevoix meets the Saguenay Fjord is rich in marine life and one of Canada's most popular whale watching spots. 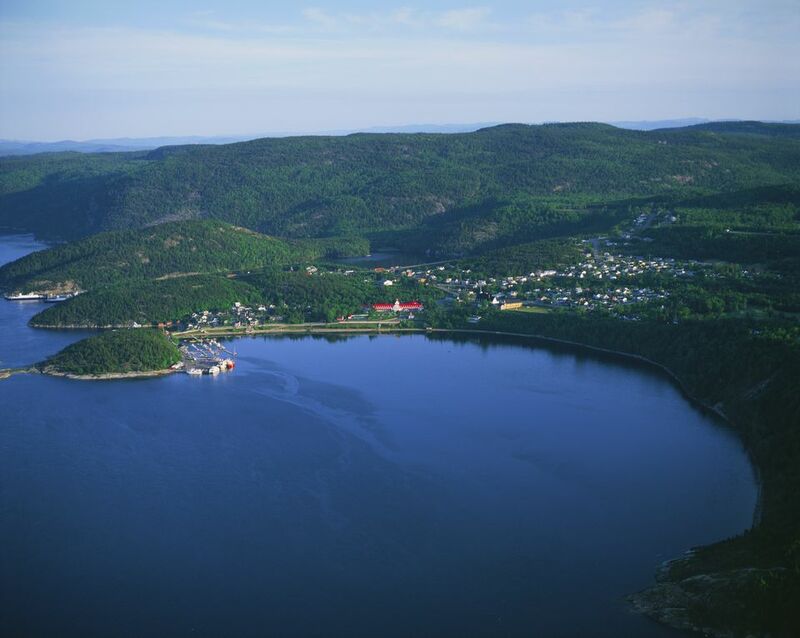 The Saguenay River's mix of Atlantic Ocean salt water and inland fresh waters cultivates a thriving krill population, which creates an optimal environment around Tadoussac for a host of marine animals, including fin, minke, blue, and beluga whales. You can see the whales here in many ways. A cruise on the river will give you a firsthand look at many varieties of whales from deeper waters. Many cruises offer not only the chance to see whales but also trained naturalists who can help you understand these creatures even better, whether on a larger excursion boat (holds 100+ people) or smaller, more nimble zodiac (room for 5 to 12). Book ahead online, certainly the best strategy in summer months, or arrive and take your chances. The two main cruise companies are Otis and Croisieres AML. Another way to see the whales is actually from the shore of the town. From many vantage points, it’s possible to look out and see smaller whales like minkes and belugas. For the truly adventurous, take a kayak on the waters for a more intimate whale watching experience. Eastern Canada is fall foliage central, so come the end of September through October, the Quebec trees, especially the maples, are ablaze in orange, gold and crimson. Tadoussac, which sits where the Saguenay and Saint Lawrence rivers meet and has a backdrop of undulating forested hills, is a visual feast during autumn. For more intense colours, keep heading west to Quebec City or Montreal. The best colours tend to be around there, in, for example the Laurentians or the Eastern Townships. The walk to Maison des Dunes may seem underwhelming but once at the top, you'll have a wonderful panoramic view of the expansive dunes below and the Saint Lawrence River. There are many wonderful spots to sit and appreciate your surrounding and possibly sight some passing whales. Bring binoculars if you can. The dunes themselves are a delight for kids who will readily wear themselves out running up and down. In addition, some people still today undertake "sand skiing, " which is just what it sounds like. The walk from Tadoussac is a boring, not so scenic 20 minute walk, so you may want to drive or take a cab. The "house" of the dunes is often not open, so though an admission is technically required, you may not be able to pay. Looming large over the Tadoussac harbour with its distinct red roof and perpetually crisp white exterior, the Hotel Tadoussac has a long history dating back to 1864, when it first opened its doors to vacationers arriving by steamship along the Saint Lawrence. The building's long, brilliant red roof is typical of Quebec maritime architecture. The roofs were painted this way to be visible to the fisherman and other sailors out at sea. The hotel still operates today. Even if you don't stay, pop in for a drink or bite to eat to soak up the history and ambience. The hotel is also famous for being featured in the movie version of the Hotel New Hampshire. The Marine Mammal Interpretation Centre is a beautiful and modern interactive family friendly center focusses on the the marine mammals, specifically those local to the Saguenay Fjord and Saint Lawrence River like whales, seals and sea creatures in the food chain. Bilingual staff are knowledgeable and engaging. Not cheap to visit, but rest assured proceeds all go to marine mammal research. In addition, tickets are good for two days so visit before your whale watching excursion and then ideally a follow up visit after you've seen these magnificent animals first-hand. Do I Have To Speak French in Quebec?